CBS has moved CSI: Crime Scene Investigation to Sunday nights at 10pm this season — typically a sign that a show is on its way out. But, could the ratings turnaround and start to rise? Will the venerable series be renewed for a 16th season or will this be the end? Stay tuned. The original CSI continues to follow Las Vegas crime scene investigators as they try to solve bizarre cases. 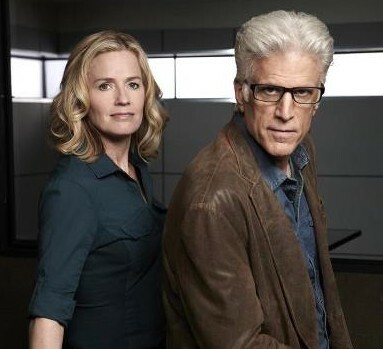 This season’s castmates are Ted Danson, Elisabeth Shue, George Eads, Jorja Fox, Eric Szmanda, Robert David Hall, Wallace Langham, David Berman, Elisabeth Hamois, and Jon Wellner. 5/13 update: CSI: Crime Scene Investigation has been cancelled but will wrap up with a TV movie. Final season averages: 1.3 rating in the 18-49 demographic with 8.26 million total viewers. Due to a Nielsen glitch, some of the early ratings of the 2014-15 season were revised a couple weeks later. For comparisons: The 14th season of CSI averaged a 1.9 rating in the 18-49 demographic with 9.93 million total viewers. What do you think? Do you still like the CSI TV series? Do you think it should be cancelled or be renewed for a 16th season? I think they should still run it,it’s better than csi cyber. Csi ny,csi miami, need to come back an stay. The left as a open ending. This show is and always be special. . when i watch criminal minds sometimes that gives me bad dreams. Csi goes by facts and less groes the people work together as a family. I hope the show continues with Catherine as the leader to take care of the girls who list there mother working in her casino. Marc is excellent. Want the team back.. They ended when a blood moon going on. It was so sad please bring back the show is special.